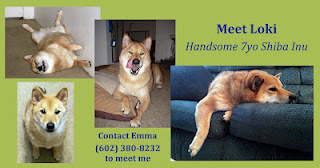 Arizona Shiba Inu Association: Loki has a new home! We just heard that Loki has found a new home, and just in time. Thanks to everyone who spread the word on this boy. Please contact ASAP to return a female from Jan Coak or to turn this Shiba into rescue.